Thank you Amy for this interview. You are a prolific writer and I admire your work. How did you come with the idea for this book? An editor once asked me to write a story about Day of the Dead, which indirectly led to Abuelita Full of Life (Luna Rising). My own personal experiences with death did not lead me to a picture book. As for Day of the Dead, my kids and I do make an altar every year. We do invite some friends over to add to our altar and make tamales. For me it is a reassuring way of accepting death, and it is a day to remember our dead. But our traditions are kind of our own. They aren’t something I grew up with. None the less, I played with the suggestion in the back of my head. Great the editor gave you an idea, the seed. When did you start watering and taking care of it? One morning I saw my daughter wrapped up in an afghan my mom made and a possible story came to me. It struck me that one day my mother will not be with us and we will be left with these pieces of her, the afghan she made and the recipes she shared. I decided to write about a grandma who teaches her granddaughter some Mexican traditions, like keeping an altar. The grandma dies, and the little girl makes her an altar. Then she wraps herself up in her grandma’s blanket and sits in front of the altar. Eventually the blanket feels like a hug from her grandma, and the girl senses that her grandmother will always be with her, even in death. Except that I never wrote that story. I wasn’t moved to write about death. Not now. And trying to create feelings I didn’t have wasn’t working for me. But the grandma topic stayed in my head. Many times authors write “in their heads” instead of paper or computer, until the ah ah! moment. When did the seed bloom into a flower? It was watching two grandmas with their grandkids that gave me the idea of writing about a lively grandma. Two summers ago I was visiting a friend. His mom had just arrived from Mexico. I was amazed at how well she could keep up with her grandkids and by the long walks she took with them. She was about the liveliest woman I had ever seen. I knew right then that I was going to write about a lively grandma. A couple of weeks later another grandmother told me about moving from Mexico to Oregon and sharing a bedroom with her little granddaughter and telling her stories at night. I thought about the lively grandmothers I know, including my own mother. And I thought about my daughter’s grandmother in Mexico, who has helped rear twenty-some grandchildren. I started writing ideas. This was a story I could relate to. Do you have a family full of Life? Writing about extended family appeals to me. When my daughter was little and I was in college we always lived with my sister or my parents. They helped with babysitting and money. My daughter and I lived with family until she was in second grade and I had my first teaching position. My sister was a second mother. My father was a father figure.¡ Pero mi mamá! She cooked, sewed, played, helped with homework, sang and baked. When it came to my daughter, my mom had a special touch. She was an Abuelita who was very full of life. I had a story. 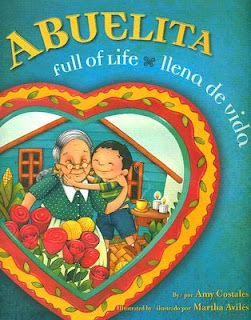 What was the process from manuscript to publication for ABUELITA FULL OF LIFE? I struggled to get my manuscript into a structure I liked. I had chunks of writing but they were not tied together. My neighbor, Ginger, helped with the idea of repetition. 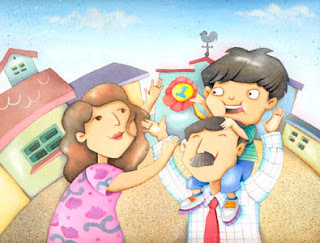 I repeated the line “Abuelita was already old when she came to love with José and his family” and added a detail that stressed her old appearance with each repetition. I wanted her appearance to contrast with her liveliness. Finally, I sent a manuscript called Abuelita Was Old to Luna Rising. Luna Rising accepted the manuscript, but Theresa Howell had hesitations about the implication of death being near. She wanted me to stress the lively qualities of the grandmother as much as I had stressed her age. That led to repetitive lines about the grandmother being lively, having power when she speaks, and arms that hug tightly. In addition, Theresa suggested putting the story in present tense and changing the title. Abuelita Was Old became Abuelita Full of Life. In this edited version, life is stressed. The Abuelita in the story is a treasure, un tesoro. How do you feel now that this great book is published? I feel deeply satisfied whenever I read Abuelita Full of Life. It is a story that evokes something familiar to me and I love the illustrations. Martha Avilés tenderly captured a wrinkled woman with swollen hands but a spry cumbia step. I hope to be that kind of Abuelita one day. How are your readers reacting with the book? I think this book appeals to many readers because I see people’s eyes light up when they see it, and then they stop and tell me about their Abuelitas. Amy Costales has lived in Spain, Mexico, Thailand, and India, but recently returned to the United States with her family, where she is a Spanish teacher. As a little girl she shared her adventures with her super best friend, Clara. They inspected tadpoles, looked for counterfeit money, planned pet parades, and climbed Clara’s oak tree. One day they had a fight over magic potion and Amy Costales had to learn how to apologize to her super best friend. Nowadays she shares her adventures with a dog named Gracie, a kitten named Lola, and her children, Kelsey and Samuel. Piñata Books will publish my sequel for I AM RENÉ, THE BOY/ SOY RENÉ, EL NIÑO. Now René is back and will work to have his two last names, just like in El Salvador. At school, they call him René Colato. But what happened to his Mamás beautiful last name? René is not a complete boy by being only René Colato. In RENÉ HAS TWO LAST NAMES/ RENÉ TIENE DOS APELLIDOS, René will show his teacher and classmates the beauty of having two last names and two lovely families. I'm so glad Rene is back. I loved the first book and the illustrations were awesome. Review: Ana Castillo. The Guardians.